So easy to use — just clip it onto your wheelchair and you can be hand biking in seconds. 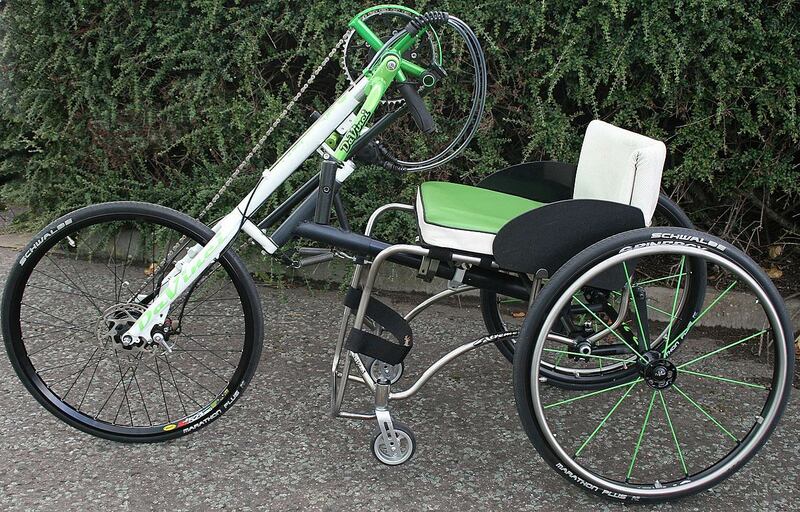 Ideal for the first time hand cyclist using a Shimano Nexus 8-speed hub-mounted gear set and a back-pedal brake. You simply pedal forward to go and backward to stop. With the gear shifter mounted on the top of the frame it is very easy to select the gears and keep going at the pace you want to set. With a number of retro fit options you can upgrade your hand bike as your hand cycling needs change. At DaVinci Mobility we can make virtually any wheelchair to your exact specification — that's what we've been doing since the 1990s and we have hundreds of happy customers who come back whenever they need an upgrade. We're also experts when it comes to motor vehicle adaptations — we're Motability accredited fitters of hand controls. We love to chat about all things mobility related to help our customers so please get in touch to discuss your requirements.